You are probably looking for a stainless alternative. Stainless has been the finish of choice for almost 25 years. Most of the other finishes over my 31 years at Yale like White Ice, Black Ice, Oil Rubbed Bronze, Platinum, Coffee, Gray, Toast, Coppertone, Harvest Gold, Harvest Wheat, and Almond have failed to be a suitable alternative. So it is fitting that the next hot finish would have a stainless component. 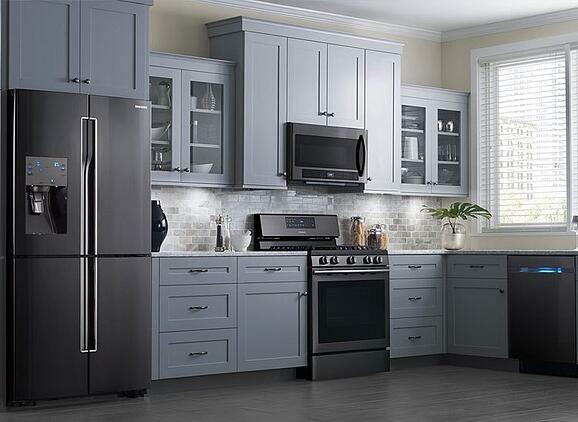 Black steel is a shade darker than stainless and is now 30% of kitchen package sales for appliances. This dwarfs any number for any stainless alternative finishes. Black Stainless Steel is an oxide coating over stainless. 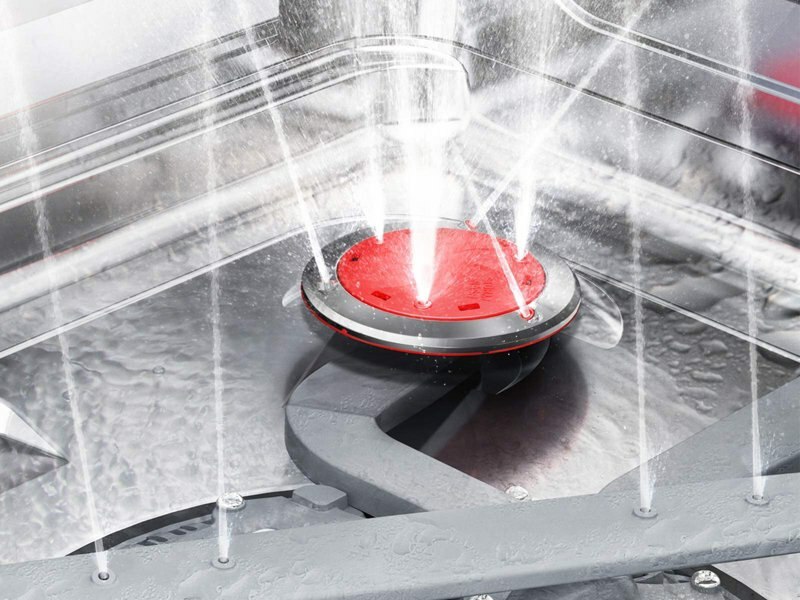 Unlike the finishes, the coating can scratch leaving the shiny stainless undercoating exposed. Before you buy Black Stainless from any manufacturers, look at the results of our scratch test by watching the video below. We scratched all the products with a tray, spatula, and fingernails. They all performed well. Under duress with a key, only Samsung resisted scratching. If you have children (I have a 14-month old), Samsung should be your first consideration. Your little bundle of joy will not be able to scratch it. However, the others are fine absent from serious abuse. You should always wonder whether an alternative finish will be around in 10 years for a replacement. This is a lesser concern because of its popularity. 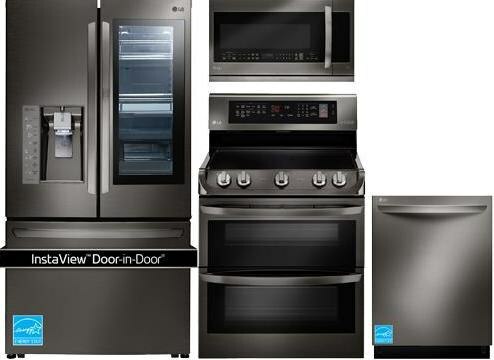 Below are the top three packages to consider from LG, Samsung, and KitchenAid. There are more combinations, but these are the top sellers. Samsung has always been a company who is at the forefront of innovation. 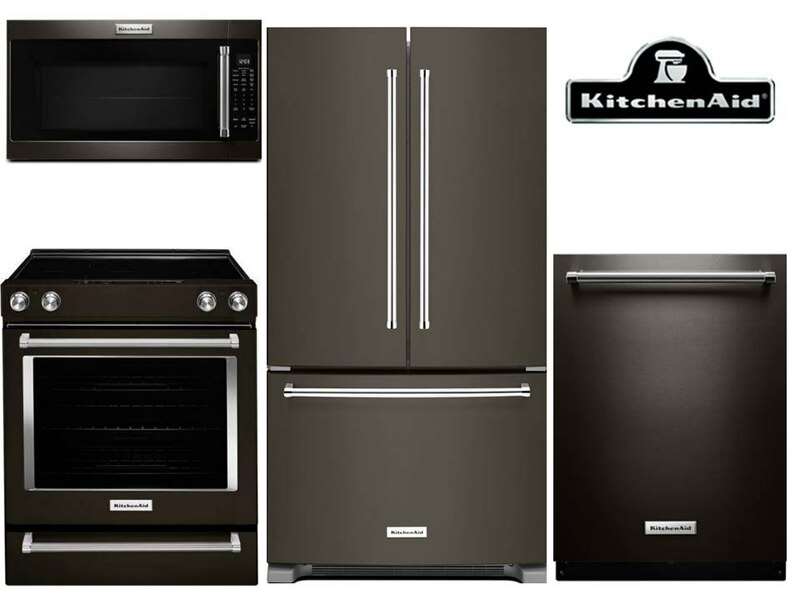 It comes as no surprise that they are one of the first companies to have an all-black stainless kitchen suite. 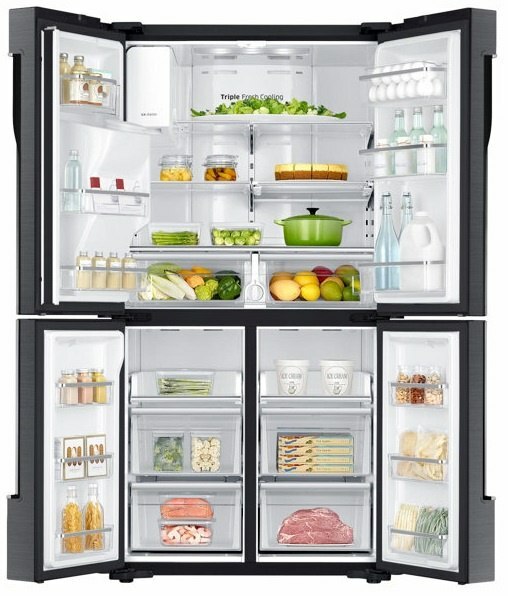 Their 4-Door flex refrigerator will give you the flexibility to make the bottom right door a fridge or a freezer, which gives you more room to store fresh vegetables. Their slide-in is stylish and the dishwasher has the "Storm Wash", a concentrated spray for baked on dishes. 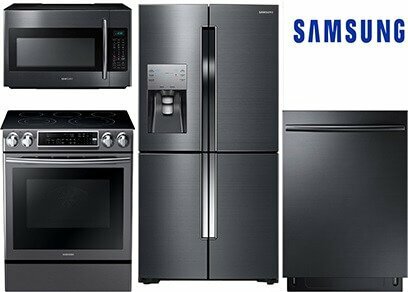 Samsung is the most scratch resistant Black Stainless Steel. KMHS120EBS - 1000-Watt Microwave with 7 Sensor Functions - 30"
KitchenAid, who is owned by the Whirlpool Corporation, will give you the best dishwasher out of the three brands. KitchenAid is the newest of the three brands to roll out their black stainless package but this package is a very nice look with their stylish handles and red end caps. Their finish is darker than the other two. The oven is huge and the largest of the two. The refrigerator is just the base French door and does not have the amenities of the other two. Of the three, KitchenAid may have the best dishwasher and range. LG is similar to Samsung in their innovations and first to market offerings. LG offers the InstaView window, and with a simple knock on the door, you can view what is on the inside without opening the door and releasing the cold air. Like Samsung, the oven is convection and the dishwasher is integrated. This depends. Not to overstate this point, but Samsung is the most scratch resistant. For refrigerators, their 4-door flex allows you to convert the refrigerator to freezer and back again for the bottom right-hand compartment. The LG Instaview is a decent feature (and scratch proof), but of the three, KitchenAid has the best dishwasher. You should also look at all three because LG is actually black, KitchenAid is a darker tone, and Samsung is more metallic looking. You will find less available service and technical support from LG and Samsung. In a very short period of time, both brands have become popular with newer technology. Their problems are growth-oriented, but they do have issues finding techs to support their incredible growth. Need help with appliances? Then download the Yale Appliance Buying Guide with features, the answers to the 10 Most Frequently Asked Questions, and even the best time to buy an appliance. Well over 210,000 people have read a Yale Guide.